When you are China with a population of over 1.5 billion people, you are destined to make large construction projects a way of life. In Beijing, the current city population is 20 million, served by five main railway stations located in the south, east, north, west and centre of the city. 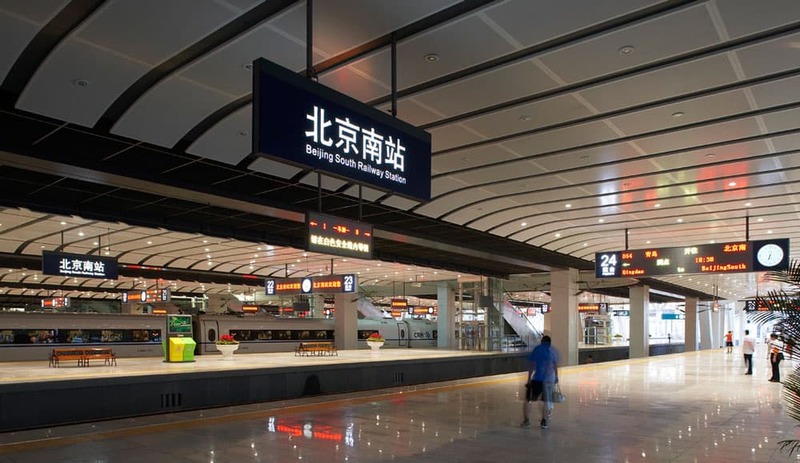 The city of Beijing needed a new railway station that would serve as a high-speed intercity railway link connecting Beijing to the cities of Tianjin and Shanghai. Beijing South Railway Station is an ultra-modern transport facility designed to be one of the four key railway links for China’s fast-growing high-speed intercity network. Designed by Farrells, this massive form spans 320,000 square metres of floor area situated in 31 acres of land. 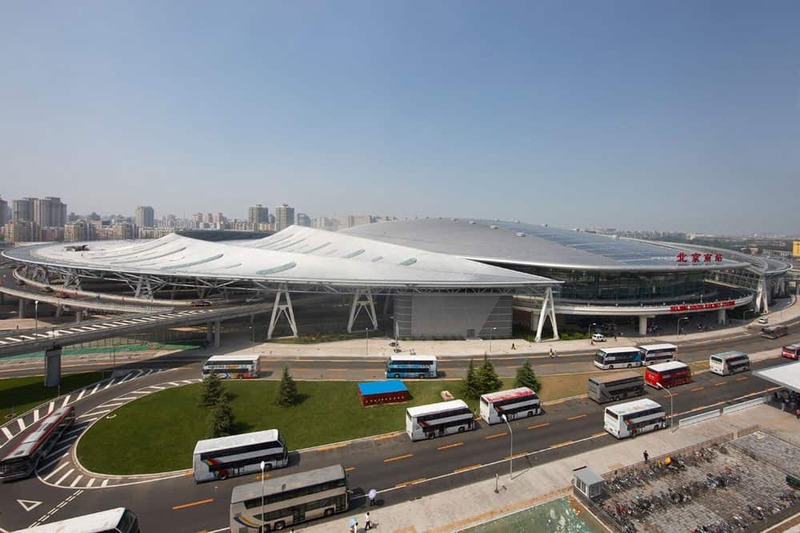 In comparison, the railway station beats Beijing National Stadium (the Bird’s Nest) in both size and area making it one of the largest railway stations in Asia, and indeed the largest in Beijing. The project was both an upgrade for the old railway station used since 1897 to 2006 as well as a key project for the Beijing Olympics in 2008. It’s a no wonder it was completed so fast, with construction lasting 3 years beginning in 2006 when the old railway station was shut down, and ending in early 2008 just a few months before the Olympic Games were set to begin. Being a cornerstone of the new high-speed rail implemented within China, the station serves as a terminus for high-speed trains that reach speeds of upto 350 km/hr (217mph). The architects had to design for immensity in scale, sticking to an architectural form that was both simple, clear and people-oriented. For a station that was set to handle over 285,000 passengers every day, it was important for the design to take into consideration the several operations and management of the various lines, station entrances, exits, waiting areas, and interchange zones. The form follows a simple ellipse created to accommodate for 3 chief floor levels with two mezzanine floors. The mezzanines house car-parking areas and two ancillary gateway office buildings. As the architects inform, it was important that at such a massive number of passengers departing and incoming passengers be separated. The architects also had the intentions of making sure that the distance covered by passengers before boarding or alighting a train was as short as possible saving time and relieving the station of traffic faster. The underground basement car-parking was designed to for 909 cars. Separate zones were incorporated into the design to allow for seamless transition and integration of various types of vehicular traffic. Some of the zones include 28-taxi drop-off bays, 24 taxi-pickup bays with 138 queuing spaces. A 38-bus-space with 12 drop-off points and 26 pick-up bays with 48 queuing spaces was also provided. The transport hub’s elliptical plan also complements the vehicular traffic flow. An overhead road network is flexible to adjusting to traffic flows and taking cars in and out from all directions leading to reduced congestion in the urban roads surrounding the railway station. With 11 island platforms and 2 side platforms both incorporated into the facility, the high-speed, express and intercity trains all have platform edges bringing the total number to 24. There are two island platforms with 4 platform edges for the Metro trains in the basement levels. Built by 4,000 workers who worked on making sense of 60,000 tonnes of steel and 490,000 cubic metres of concrete, the station’s ceiling was outfitted with 3,246 solar panels to generate electricity. The waiting area is also a humongous 251,000 square metres with a capacity to accommodate 10,000 passengers. Arrivals are underground served by 8 arrival gates in the subway concourse. Ticket machines and counters including a variety of restaurants and corner shops line both the arrivals and departures areas. Waiting areas and VIP lounges are located on an elevated departures concourse. Since the station will serve three cities, majorly Beijing connecting to Tianjin and Shanghai, the total catchment area will be up-to 270 million people with the station expected to serve 105 million passengers annually by 2030. By inserting a landscaped pedestrian area in the formal north-south axis, the architects have created public amenity spaces which connect the city to its wider context. Generally, the urban link created by the Beijing South Railway station makes it a gateway to the City of Beijing. Uniting the railway fan and the city grid maximizes the effects of the station’s existence to the surrounding. With the reported number of domestic tourists in China shooting upto 2.1 billion in 2010, this enormous oval-shaped railway station will continue to be a favorite for the large number who prefer travelling by rail to air.